Anyone who has ever spent any time in the great north woods knows what a plague the stinging flies and insects can be. Insects bother animals, not just humans, and the grizzly bear is no exception. The size and strength of the grizzly is no match for the persistent buzz and bite of the flying insects. 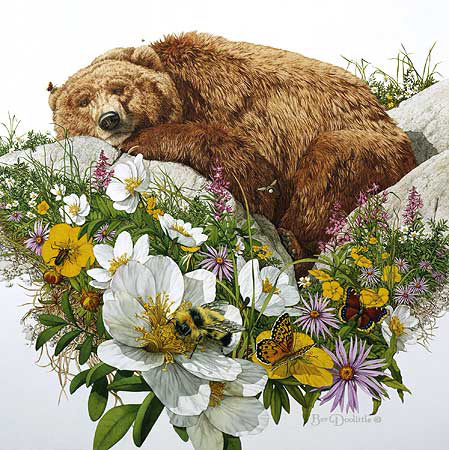 Here a grizzly lies among a profusion of summer flowers stoically trying to ignore the flies, gnats, bees and mosquitoes until their season is over.